See, I told you I like breakfast sandwiches (check my Almond Flour Biscuit post)! 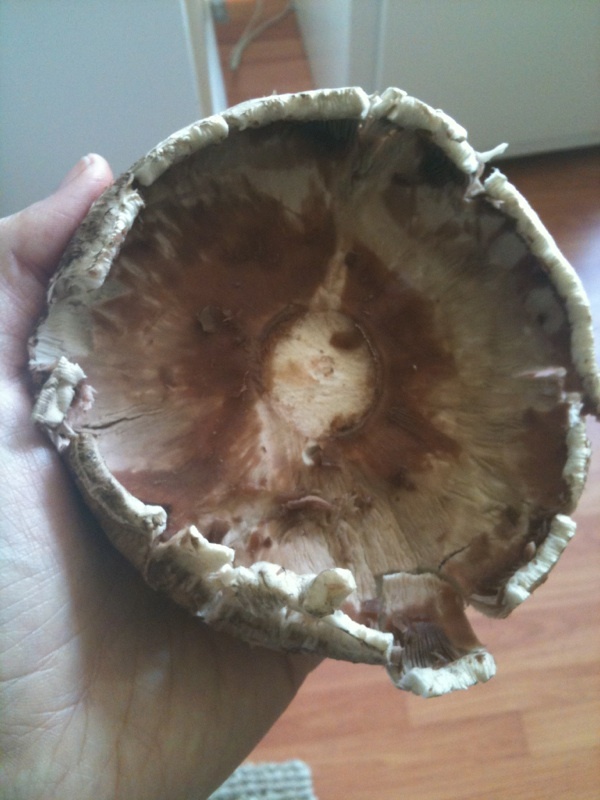 This a great alternative to using bread as a vehicle for your food, it’s also another good Paleo breakfast item. I couldn’t resist trying a new version, especially since it’s nut-free. Nuts and I have a complicated relationship. Actually, I make it complicated. The nuts really hold no blame in this scenario. I tend to have an addictive personality. Okay… okay, not tend. I DO have an addictive personality. I find something I like and I go CRAZY over it. My coconut hiatus last week was an attempt at reigning in that obsession. Unfortunately, when I shut down one obsession, another one starts up. Enter my friend (foe), the NUT. I found myself going back to my nut dependence that I originally steered away from by introducing more coconut products. Here’s the bottom line: Too much of anything is not good. As a person with life-long digestive problems, nut consumption presents quite an obstacle to “feeling well” gastrointestinally. Not to mention, nuts are relatively high in Omega 6 fats which will sabotage the hallowed Paleo goal of balancing your O3:O6 ratio. In newbie Paleo-eaters, I almost always hear or see the tendency to over-consume nuts. They are fast, easy and tend to be filling. For me, I could eat nuts until I burst. They really do not make me feel full or satiated… which presents a problem. So my solution is to try not to have nuts around the house. If I do eat them, it’s usually in the form of a “condiment” on salads or in sauces or I will make a dessert-type item OCCASIONALLY (everybody’s favorite diet-related word used to cover up over consumption of questionable items. HEAR YE, HEAR YE! Occasionally means: Not habitual; infrequent). Sorry, it looks like the sandwich is birthing a yolk. In a skillet, melt the bacon fat and dip mushroom buns into the oil. Take out ans set aside. Over low heat, saute onions until soft and a bit caramelized. 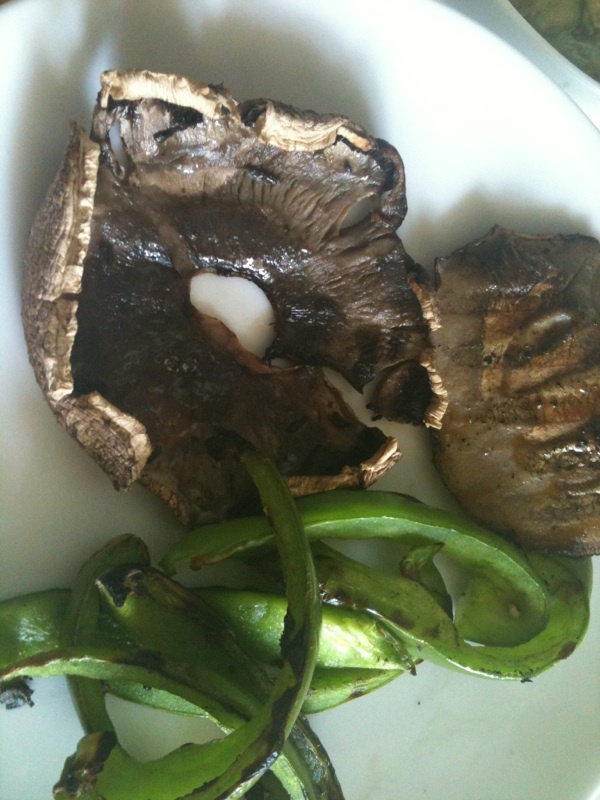 Heat up your BBQ grill and over medium heat, grill mushroom halves until tender. Remove sautéed onion from the skillet and fry up an egg. I like mine a bit runny so this goes pretty fast. 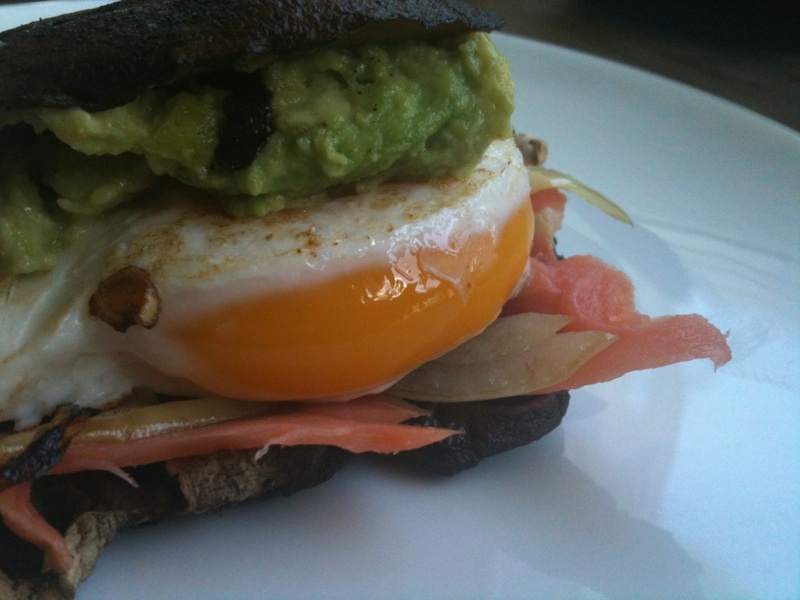 Layer salmon and onions over bottom “bun” add fried egg and avocado and top with the other “bun”.